Kathy Eldon produced the Emmy Award nominated documentary Dying to Tell the Story after her 22-year old son, journalist Dan Eldon was murdered in Somalia. As a young journalist in Kenya, Kathy Eldon used the power of the media to bring attention to the ivory trade. She went on to create an extensive portfolio of books and films. The death of her son, Dan, at age 22, while on a journalistic assignment, in Somalia, propelled her to tell the most important story of all: Love, loss, and forgiveness. She co-founded Creative Visions Foundation to help other artists to use media and art to drive social impact. Kathy Eldon speaks with impactmania about the day-to-day challenges of the Foundation, her impact makers, and the “importance of living in an urgent sort of way”. Kathy, what do you feel is needed for social impact? Most people want to do something good in the world, but often they don’t know how. It’s a question of giving people tools and resources, access to networks or organizations that can help them engage, mobilize, and create for themselves. Creative Visions Foundation has the concept of fostering the concept of creative activism. The sense that every human being has a creative spark within that can be used not only for yourself, but also for others. We have worked closely with people using media and the arts for social impact. To create real change, we need to use the power of media. And I would say the arts because the arts are what touch our soul, whether it’s music, art, dance, drama, or film. It is that combination of an idea transmitted to the largest possible audience through media, but that will touch the soul and make you want to engage and act. What has been a surprising learning for you founding Creative Vision? The challenge of organizations such as ours is keeping up with the demand. In 1991, I started a film company called Creative Visions to make a film on ivory poaching. I realized that film was the way to go because it would touch larger numbers of people. 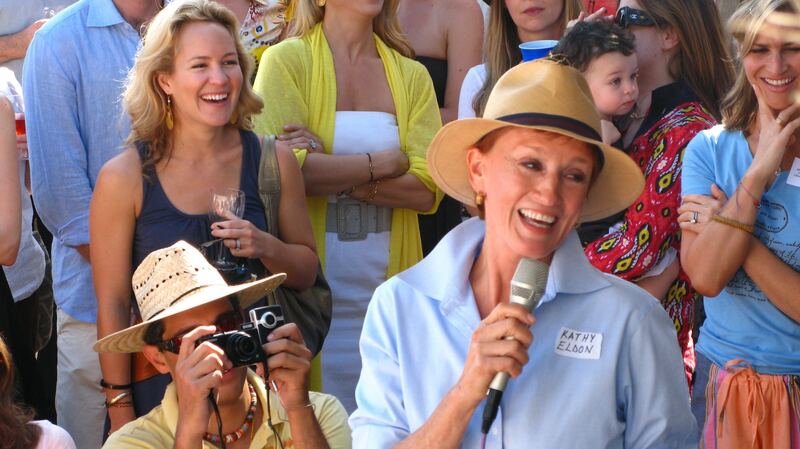 In 1998, I launched the foundation, which I always wanted to have supported by the earnings of Creative Vision. That was an illusion, because I didn’t make enough money, but the foundation is what then possessed me and has taken a lot of my energy. It is challenging to be able to keep up with providing the resources, the organizational skills, and paying the rent. The challenge on a daily basis of funding is totally overwhelming at times. Most people who are trying to do something that they perceive as good in the world, whether social, environmental, or humanitarian are grappling with similar challenges. My heart goes out to every one of them! Give me an example of a Creative Vision Foundation’s supported project? Rock Your World program is pretty magical. The program has taught 700,000 children the basics of human rights. For them to find an issue that’s concerning them in their community or the world. These kids then tackle it and produce quite remarkable videos, PSAs, and poster campaigns. Our creative activist projects have landed in 32 countries. It’s amazing to see the volume. I ultimately am looking at is what we haven’t done, where the world is, and how desperately the world is in need of inspirational, calm leadership, and values. I’m looking for who is going to lead us in the way? A Gandhi, Martin Luther King, or Kennedy, where are those inspirational leaders? That’s what I’m most concerned about. What kind of projects could bring the social impact you are looking for to the next level? I spent many years trying to make a feature film about the life and legacy of my son Dan and his friends: young journalists and activists. We produced the film with Kweku Mandela, Nelson Mandela‘s grandson, in South Africa a year ago. It premiered at the Toronto Film Festival with 2,000 people. It’s an extraordinary vehicle for social change. It has been incredibly challenging to get it funded. I now know it couldn’t come out earlier; it needed to come out now, because the world is in such desperate need of inspiration. The film is a metaphor for what’s happening now, whether it’s around radicalization of Islamic youth, the issue around refugees, journalists-at-risk. It has many contemporary issues, but it’s made in a more palatable way because it is a historical narrative, it’s a feature film. I’m pinning a lot of my hopes on this film’s ability to excite and mobilize audiences; especially the young do something wonderful. In one of your TED talks, you mentioned that for years after losing Dan, you had a hard time reclaiming your life. What spurred the hurt and anger to change to a force for good? There are complex emotions that would occur when losing a child. Dan was murdered together with three other beautiful young people by a mob. It was a complicated anger. It was hard to be angry with the killers, because I understood it. It was horribly sad how these people had been suffering so much. America was part of the suffering that the people needed to strike out at these innocent young people who had come to tell the story. If I didn’t do something positive and exciting and stimulating for my psyche, I would probably died. The grief was so profound. I almost immediately tried to transform the horror of what had happened into something positive. We launched into exhibitions about journalists at risk. My daughter interviewed journalists all over the world.We did a beautiful documentary called Dying to Tell the Story about journalists-at-risk, which was a TBS film that was nominated for an Emmy. Within about three months after Dan and his friends were killed, Reuters and the Associated Press did Images of Conflict, which was a book and a traveling exhibit. I was deeply involved with that, and then crusading for the concept: be aware that there is somebody in between you and the news. The costs to the individuals in the field: the pain of what they’re seeing and the post-traumatic stress. For some the cost is their lives. What would Dan say about all your work and the Foundation? I hope he’d be proud of the initiative that we’ve tried to help and support. It’s a community of people that he would really love, these wonderful artists, writers, musicians, theatrical people, and filmmakers. He’d be chuffed [British for very pleased] to know that we’re having such fun doing something that has his name associated with it. We always ask our interviewees who has had an imprint on their professional DNA? Obviously, these would be Dan and Amy, you daughter, who is the co-founder of the Creative Visions Foundation. Who else has affected you as a leader, author, and filmmaker? What a lovely question. I’m very impressed with two amazing women who, early on, adopted Amy and me. When we wanted to do this film about journalists at risk, we took it to two people at TBS: Pat Mitchell, [The first woman president and CEO of PBS] and her head of production, Jacoba [Colby] Atlas. Watching those two women tell stories that need to be told about problems that need to be solved was remarkable. The way these women operated, the candid way of expressing what they felt about a project. They were never mincing words, but they always did it with such respect; led with a positive, and made you feel like you’re incredibly special and the work you’re doing really important. It really impressed me so much, and hopefully informed my leadership style. I would never claim to be anywhere nearly their brilliance, but I’m very grateful for them as mentors and leaders. Is there something that Pat Mitchell and Colby Atlas said that still sticks with you? It’s the sense that there is always a way to tackle things, even in our darkest times when we feel like giving up. Often, the timing is not right or we’re not quite ready. When you are working on a project, you may meet so much rejection, but it doesn’t mean that it’s over forever. It means that right now, it isn’t the right time. Learn from it, go back and reshape it. I had to make that film about Dan, The Journey to Decimation. But for 23 years, I wasn’t ready. It’s not to give up on your dreams, follow the energy, and don’t bullheadedly take the same thing out over and over again. That holds true for a lot of starting entrepreneurs as well. Yes, by the way, my book took 16 years to write! I wouldn’t have led the life that I could share a story that was worth reading. I recently saw somebody rejected from a film festival that responded in quite a shocking way — questioning the sanity of the deciders. In life, there are things to be learned such as the ability of being gracious when something doesn’t go your way. The way we react to rejection is important. There is another quote that I love: Rejection is God’s protection. Often when we are rejected, we get it later on; we understand why that had to be. It is the same way with relationships. I love that your impact makers are both women. You may have not seen it, but why are women still so lousy at supporting each other? In my world, our women are very supportive, but everybody is working on their own projects. We work with mentors who help others. I do understand that in corporate America or film industry America or in many other realms that women are not supportive. I don’t understand it. Whether it’s women or men: A rising tide lifts all boats. Whenever you can help someone else, go for it. 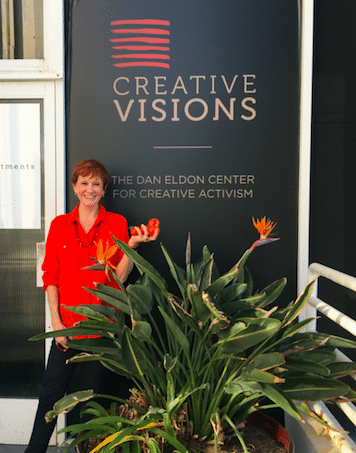 Kathy Eldon, shining bright, at the Creative Visions Foundation office in Malibu. Photo by impactmania. What’s next for you besides the feature film? The organization is nearly all consuming, which is a challenge. I’ve done about 17 books over the years; I have several more books in me! I want to help a movement — I want to help individuals around the world to understand that we are all connected and we need to connect to the earth. It’s that Ubuntu [humanity towards others] to thrive as individuals and as a global tribe, the children of the planet. I’m ready to unfurl my wings. I’ve been flapping for a while and maybe flapping in place. As much as I’ve enjoyed it, it’s time to trust and attract whatever is the next stage of my life. Give me a few words that describe your journey so far. Unexpected, tumultuous, challenging, fulfilling, funny, magic, joyous, compulsive, compelling…The journey is the destination, that’s the quote that Dan used. That is it ultimately, if nothing more happens. I’m grateful.